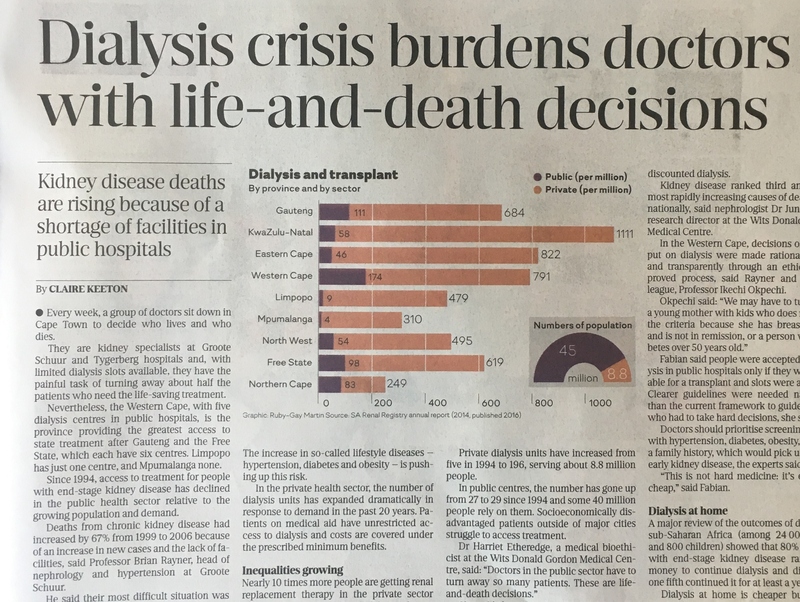 Role-players in the dialysis community – yours truly included – were quoted in an article about the dire state of access to dialysis in yesterday’s Sunday Times newspaper. The article reflects a number of important points. Firstly, SA has a “two tiered” health system. In the private sector people pay for their healthcare, usually through membership of a medical aid or “out-of-pocket” payments. About 15 – 25% (a conservative estimate) of the population is sufficiently well-off to access the private sector. The rest have no choice but to (try to) access healthcare in the state sector – which is funded by the government. In perspective, in 2012 the amount spent across each sector was much the same (ZAR 139.7bn in private vs ZAR 140.7bn in state). But when you consider that far more people are seeking care in the state sector, you get a sense of how little there is to go round. Compared to the private sector where care is pretty much ‘on-demand’. Secondly, the state sector has very few dialysis facilities. Many state patients are turned down for dialysis because there are simply not enough machines to provide for everyone. The consequences are disastrous. Unless these patients can stump-up the cash to pay for private access (sometime charities help) then they will die. There is no middle ground here. It’s different in the private sector, where dialysis is a “Prescribed Minimum Benefit” (PMB) which means that no-one on a medical aid can be refused dialysis treatment. The result: about 10 times more people receive dialysis in the private sector than the state sector. Thirdly, we cannot ignore SA’s history. Many of those who were historically disadvantaged during apartheid are socio-economically disadvantaged now. These are the people who (try to) access healthcare in the state sector. These are the people who are being sent home without treatment. Prima facie, this situation seems wrong. It’s probably also unconstitutional. The SA Constitution says that all people have the right to access healthcare services (NB: it doesn’t say that people have the right to health – so count yourself lucky if you are healthy). The Constitution also says that the government must facilitate progressive realisation of the right to access healthcare within its available resources. When it comes to dialysis, it does not seem like progressive realisation has taken place for state patients, but that it has been exceptional for private patients. Surely this situation is untenable, and I think this is ripe for legal challenge. And it’s not only dialysis where progressive realisation isn’t evident. A few weeks ago, the last state-based oncologist in KwaZulu-Natal province quit. This means that state patients in KZN do not have access to a single oncologist now. This is not progressive realisation of the right to access healthcare. Why 2012 numbers? So old and out of date? It’s because these numbers are taken from the Government’s “National Budget Review” which is released every year. 2012 was the last review that addressed total spending across both health sectors. In more recent reports (2013 – 2016) no mention is made of private health spending. Only government spending is detailed. This speaks for itself.